Don’t think Republicans can be punk rock? Well, in 1987, they staged one of the most punk rock protests that Capitol Hill has ever seen. They smashed a boombox to pieces with some sledgehammers. The part that was slightly less punk rock? They smashed it because they were mad at Toshiba for making electronics sold in the Soviet Union. Just as US politicians today are concerned about America’s trade deficit with China, people of the 1980s were concerned about the trade deficit with Japan. In 1981 the American trade deficit with Japan was roughly $10 billion. By 1985 the deficit had ballooned to about $50 billion. As M.J. Heale explains in the fascinating 2009 paper “Anatomy of a Scare: Yellow Peril Politics in America, 1980-1993,” this deficit had an enormous influence on American politics. Politicians of both parties used the rise of Japanese cars and electronics as a wedge issue, depending on who was in power at the time. When Ronald Reagan was president, Democrats sought to exploit the loss of manufacturing jobs to Japan by appealing to a constituency they’d lost in the 1980 election: white, blue collar Democrats. Heale notes that “Japan-bashing” was resonating with a wide swath of the American public in the 1980s—from automakers in Detroit to the electronics manufacturers of Silicon Valley. American manufacturing was on the decline, and politicians could point to Japan as the leading culprit. We have to stop showing that white flag, to start running up the American flag, and to turn around, fight and make American number one again in international commerce so that American jobs are filled in this country. If we don’t get cracking, get serious, and get leadership... our kids will be cheated by us. Their jobs will consist of sweeping up around Japanese computers and spending a lifetime serving McDonald’s hamburgers. So what does this have to do with sledgehammers on Capitol Hill? Many politicians used the Cold War struggle with the Soviet Union as a way to back protectionist trade measures. Toshiba happened to be selling equipment to the Soviet Union which was reportedly being used on Russian submarines. And after the Democrats had ridden a wave of anti-Japanese sentiment to snag crucial congressional seats in 1986, it was the Republicans’ turn to be outraged. The photos may seem a bit silly today, but it was a popular photo-op. 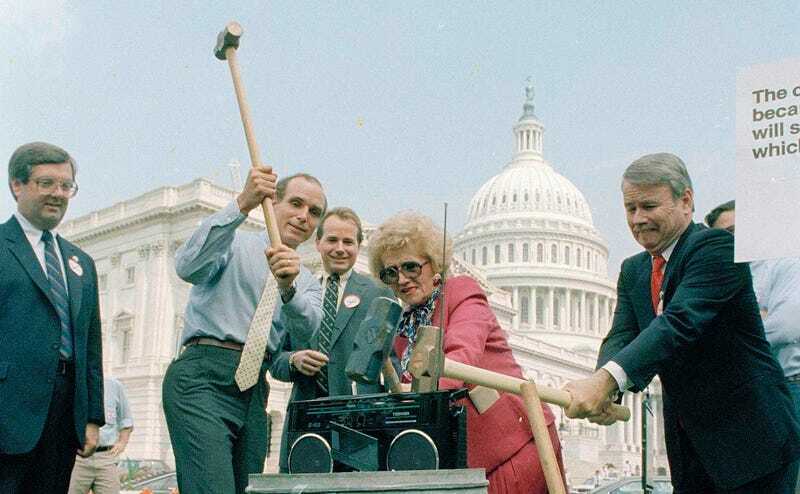 Representative Don Ritter of Pennsylvania, Representative Helen Bentley of Maryland and Representative Elton Gallegly of California all took turns bashing a Toshiba boombox with sledgehammers. As Heale notes, footage of the press conference would be broadcast on Japanese TV for years to come. The politicians were joined by a group called the American Conservative Union, which awarded Toshiba a “Golden Rope Award.” The noose was in reference to Lenin’s proclamation that capitalists are so greedy that they’d sell anyone the rope with which to hang themselves. Japan became a tremendously useful punching bag for American politicians throughout the 1980s and early 1990s. And, of course, the bashing acquired plenty of racist overtones in some circles—both Republican and Democrat alike. But by the early 1990s Japan’s economy started to collapse. America’s economy rebounded in the 1990s and saw tremendous growth under the Clinton years. With Donald Trump, the presumptive nominee for the Republican Party’s race to the White House, trumpeting the growing trade deficit with China we can expect to hear plenty more about how America doesn’t win anymore. But this is really nothing new, and takes a page from the history books of both Democrats and Republicans. The only thing we need now is for Trump to wield a sledgehammer against a $5 Chinese-made toaster. And if he does you can bet it’s going to be the best, biggest, most glorious sledgehammer ever made. The only question will be whether he can find a sledgehammer made in the United States.